T-Spec understands how difficult it can be to find just the right product for your application. 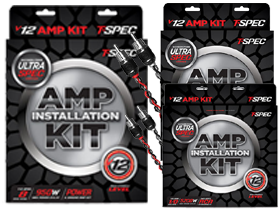 That is why the new T-Spec amp wiring kit line features 28 different models to cover nearly every price, power and performance level imaginable! utilize the finest materials to ensure maximum performance and hassle-free installation. Shop T-Spec Amp Wiring Kit only here at HalfPriceCarAudio.com.